Peel and eat shrimp is one of the most simple, yet perfect, treats from the sea. Simply peel the shell from the shrimp and dip it in cocktail sauce, maybe with a quick squirt of fresh lemon juice. As delicious as peel and eat shrimp are, they are very easy to prepare. Decide if you will be cooking your shrimp. Peel and eat shrimp are typically sold ready to eat, all you have to do is pull the shell off. Some people are timid about eating the shrimp right from the store and like to boil them first. If you wish to boil your shrimp, leave the shell on during the boiling process to seal in the shrimp’s flavor. Turn the shrimp on its back, so that the side with the legs is exposed to you. On that side, near the top of the shrimp, place your thumbs in the middle and pull the shell apart. The shrimp shell is very thin and will come off easily. Just pull apart the whole under side, from the legs to where the tail begins, and the shell should come off in one large piece. Try to keep the tail in tact, as it will serve as a decorative handle. As you peel each shrimp, place them on your serving platter. Do not just pile them up. Arrange them neatly, in circles going around the platter, making sure to leave room in the center of the platter for your bowl of cocktail sauce. After you have peeled all the shrimp down to their tails and arranged them on the platter, the next step is to cut your lemons into wedges and lightly splash the shrimp with lemon juice. You may wish to prepare additional lemon wedges to place around the platter. These serve both as a decoration and as a source of extra lemon juice for those who like more. Place your cocktail sauce in the middle of the platter. You are now ready to eat your shrimp. 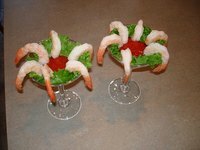 Rather than serving on a platter, some people like to place cocktail sauce in a champaign glass, then hang 5-6 shrimp over the edge of the glass so that each person has their own shrimp cocktail. You may sometimes miss a tiny piece of the shrimp shell. Do not panic if this happens to you. Swallowing the shell will not hurt you.